In a sudden and awkward about face, Amazon posted an announcement that it will be folding to demands by Macmillan to begin charging $15 for the publisher's e-books, as opposed to Amazon's standard pricing of $9.99. Last week, Amazon pulled Macmillan's books from the Kindle store in protest over the publisher's request for the bookseller to raise prices of their titles from $10 to $15 dollars. "Macmillan, one of the “big six” publishers, has clearly communicated to us that, regardless of our viewpoint, they are committed to switching to an agency model and charging $12.99 to $14.99 for e-book versions of bestsellers and most hardcover releases." Amazon wrote in a public announcement on their website. The Amazon vs. Macmillan debacle came to a crashing halt less than five days after Apple unveiled it's new iPad device, announcing that it intends to sell Apple iBooks through a special iPad app. With Apple's e-book model, publishers will be able to charge $12.99 to $14.99 for most general fiction and nonfiction titles. Similar to the deal with app developers, Apple will keep 30 percent of each sale from their iBookstore, and publishers will take 70 percent. Stephen Colbert, host of the 2010 Grammys, shock-rocked the audience at the Staples Center during his opening monologue by whipping out a new Apple iPad from underneath his jacket to deliver the nominees for "Song of The Year". He immediately started goofing on rapper elite, Jay-Z. "Jay-Z, did you not get one of these in your gift bag? "Am I cooler than you? Colbert asked as both Jay-Z the crowd are shown erupting with laughter. It certainly looked like the real deal he was holding in his hands. 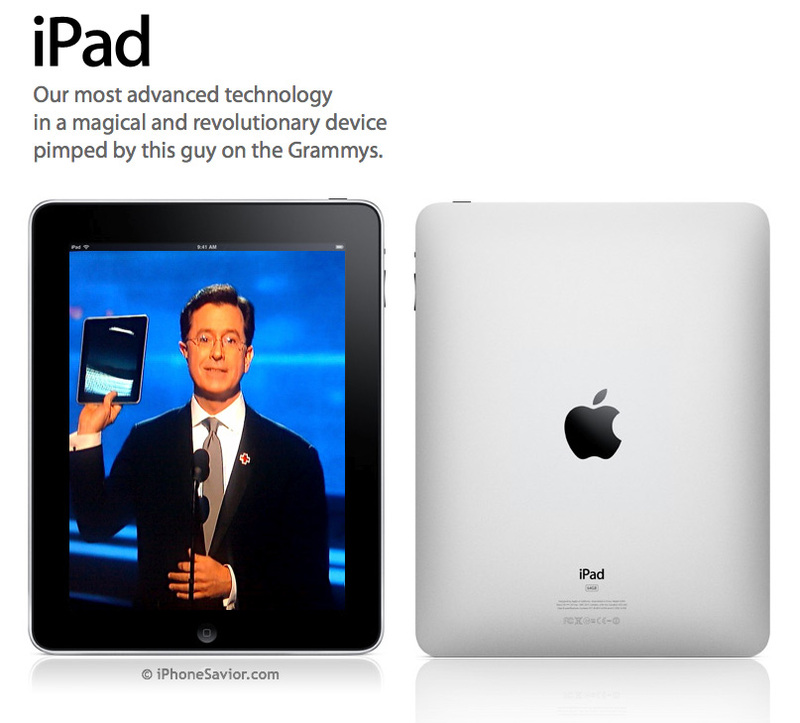 Yes, Stephen, you definitely are cooler than Jay-Z holding that iTampon tablet. Watch the video below. The sacred union of religion and Apple's miraculous iPhone took place the moment those shaved apes in mainstream media dubbed it the "Jesus Phone" back in 2007. So the idea of authentic Jesus and Virgin Mary candles making a triumphant iPhone debut should come as no real shock to Pope Benedict XVI. It was bound to happen. The concept is simple, launch your Jesus Candle ($.99) and you'll experience the flickering glow of a realistic flame designed to illuminate the room and light up your life. Watch your glowing candle slowly burn down to the bottom, then just double tap the flame for a refill. Not exactly a water into wine miracle, but what did you expect for a buck? You can easily purchase more iconic candles from inside the app. Styles include the Virgin Mary, Scared Heart and Anima Sola. There's no end to the irreverent sacrilege those twisted developers at Mopimp Productions have manged to regurgitate. I chose to place my iPhone into the Appstand frame for a more pious Jesus Candle offering. While I'm confident that a "Jesus Jobs" candle app featuring Steve Jobs delivering his "magical" iPad tablet to the world would be an instant hit among Apple faithful, it's safe to bet it will never make it past App Store approval. But I'm still gonna light a candle and pray for that one anyhow. I want to believe. The wildly popular and equally lovely Kara Swisher, who pens the Boom Town column for All Things D, captured some rare video footage of Steve Jobs pimping his iPad to WSJ tech writer Walt Mossberg, shortly after Apple's big event wrapped up on Wednesday. The home video style approach to the shooting makes the viewing experience all the more satisfying. Giving viewers the feeling that Swisher is operating a spy cam as she enters the Apple's inner sanctum. Although Mossberg appears in this video, filling the screen like a pair of bearded bookends, it's the candid moments with El Jobso that held my attention. Especially the portion when Mossberg presses Jobs on Apple's potential iBook pricing of $14.99 compared to Amazon e-books at $9.99. Jobs confidently announces that e-book prices would be the same, but his next statement was a clear swipe aimed at Amazon. "Publishers are actually gonna pull their books from Amazon, because they're not happy with them." Steve Jobs said. The camera was abruptly stopped at that point and then restarted. What Jobs said about Amazon after the cut will most likely never be published. It's still great stuff to peer in on all the same. I enjoyed Kara's clever remarks delivered off camera, including her referring to Jobs as "El Jobso". Brilliant! Well done Kara. STYLE GUIDE: If you're plagued by the constant iPhone dropsies, you should pay close attention. Voi! Lorem gave me the opportunity to test drive their ultra-slim iPhone case with the epic drop-catch tether feature and it's quickly become the case I never knew I needed. The durable hard shell exterior and interchangeable "Axent Rings" are just two of the great features found on the Voi! But it's definitely the handy built-in strap that had me at hello. While I've seen a few examples where users have drilled holes in their hard cases to add a strap after-the-fact, the Voi! gits 'er done right out of the box. The inside of the case provides a soft lining to keep your iPhone scratch free, which many hard cases in this class are sorely missing. The case profile is sleek and the Axent Rings make it easy to snap on color combos at will. Although that two-tone benefit does require buying multiple cases. One minor draw back I experienced was in the opening cut out for the volume bar. I adjust volume more than most and found the spacing here to be a tad tight. Beyond that, I was impressed with this newcomer to the iPhone case scene. The Voi! is a best in class, stylish design, offered in four glossy finishes including black, white, red and powder puff pink for iPhone 3G and 3GS. Overall, I'm convinced that you'll not find a more perfect cure for the iPhone dropsies than Voi! Lorem for $24.95. Replacing a cracked iPhone screen will cost you $199. Get it? Fring has jumped in line right behind iCall to unveil VoIP calling for iPhone over 3G. There's no update required to the app, simply launch Fring and you're good to go. Fring is a voice and chat app that supports Skype, SIP, and video calls calls over 3G. You can select Skype from Fring's list of add-ons. "Now iPhone fring users can call, video call, chat and more for FREE over 3G and wifi!" Fring wrote on their blog. Video calls are one-way-only. You can see callers through their Webcams, but they won't see you. The Fring app is not providing iPhone-to-iPhone video calling. It would make sense that the native Skype app should be following close behind, but there's currently no word on how soon the company will open up calling over 3G. The Skype app for iPhone was updated last on January 15th. Fring can be downloaded from the App Store for free. SAN FRANCISCO, CA -Steve Jobs described Apple's wildly anticipated tablet-style computer as "a truly magical and revolutionary product." when the company's CEO finally took the wraps off of the iPad in front of a packed house at the Yerba Buena Center in San Francisco Wednesday morning. iPad will be delivered to Apple faithful in late March, featuring 16, 32 or 64 gigabytes of flash memory storage, along with with Wi-Fi and Bluetooth connectivity built in. The Wi-Fi only models are priced at $499, $599 and $699 respectively. The handy dock, camera connection adapters and iPad Case which doubles as a stand, will cost extra. For those seeking 3G connectivity, you can expect to pay $629, $729 and $829 for the iPad, which will be released around April according to Mr. Jobs. AT&T is offering two mobile plans without any contract attached, which comes as relief to many. iPadders can expect to pay $14.99 per month for 250 megabytes of data, or $29.99 for unlimited usage via AT&T. Within an hour after Steve Jobs unveiled Apple's "magical and revolutionary" iPad device, the Twitter universe began to explode with references to the feminine hygiene product Tampon, poking fun at Apple's new product by calling it the "iTampon". One user went as far as suggesting a Tampon could be used as a stylus for the iPad. iTampon quickly reached the number one trending topic on Twitter, over taking "Apple iPad" at the number one spot. The idea of iTampon going viral is a hysterical concept. It certainly serves as great advertising for the Kotex brand. On December 25th, a Mac Rumors report pointed to Apple using the name iSlate for their tablet device. That grand speculation turned out to be inaccurate. Last week we featured a Mad TV spoof that lampooned Apple back in 2006 with a brilliant iPad skit that focused on a new Apple product aimed at feminine hygiene. It appears that iLife has imitated art over at Apple headquarters. Will the iPad name ever survive the ridicule. I hope not! Tooling around the Apple website, I stumbled across this fun little find. 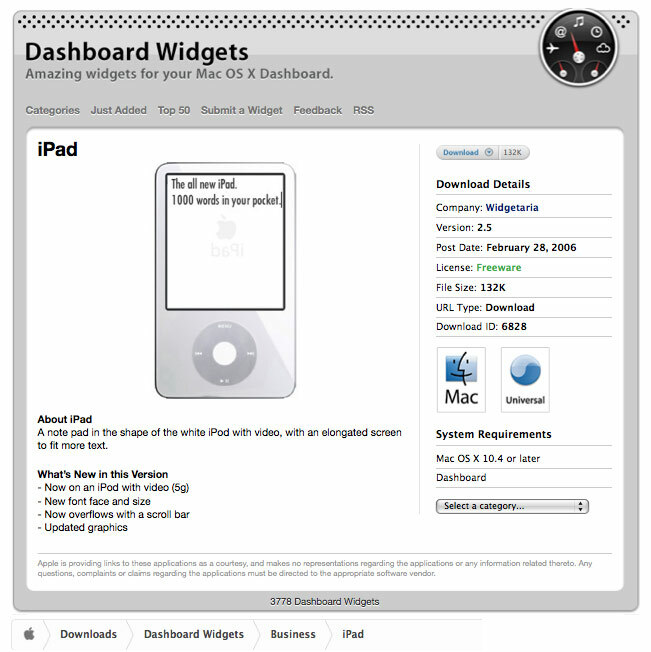 It's a desktop widget called iPad, released as freeware on February 28, 2006. Surprisingly, it's still available for download and now resident on my MacBook Air. The iPad was created for taking notes. If you look closely, you can see the Apple logo in reverse from the back with iPad also appearing backwards. The screen was even elongated to fit more text. A curious little find on the night before Apple's big tablet unveiling. Does this mean that the "iPad" name is not part of Apple's plan? There's no way to tell, but it's still a cool little widget to have no matter what Apple ends up calling their tablet device. You heard it here first. CUPERTINO, CA - When Apple announced record breaking Q1 net profits of $3.38 billion, or $3.67 per diluted share after the stock market closed today, Steve Jobs chimed in with a very untypical hint at a major new product coming this week. a sign that "dear leader' is overcome with excitement. I am certain that El Jobso was touting his wildly anticipated iPad tablet device. “The new products we are planning to release this year are very strong, starting this week with a major new product that we’re really excited about.” said Steve "Moses" Jobs, Apple’s CEO. The Company posted revenue of $15.68 billion for fiscal its 2010 first quarter which ended on December 26, 2009. This compares to revenue of $11.88 billion and net quarterly profit of $2.26 billion, or $2.50 per diluted share for the same time period one year-ago. “If you annualize our quarterly revenue, it’s surprising that Apple is now a $50+ billion company,” Jobs said. Apple's international sales delivered huge again, accounting for 58 percent of the quarter’s revenue. With Apple's tablet event less than 48 hours away, I can hardly contain my enthusiasm. It's time to start wrapping the iPhone Savior news center in plastic in order to withstand the excessively large puddles of joy expected to overflow on Wednesday morning. After all Mr. Jobs did say "products". Yawl ready for this? The myth is about to become legend.